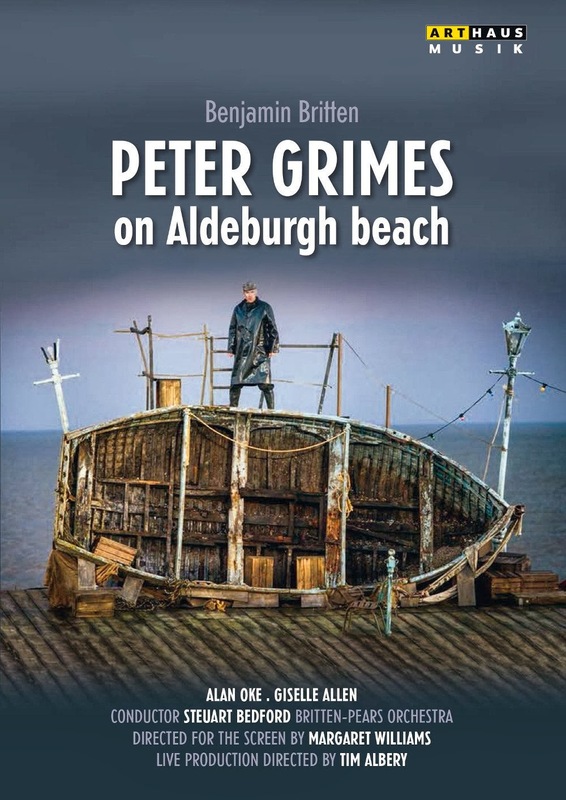 The new film of Britten's Peter Grimes is nothing short of astonishing. 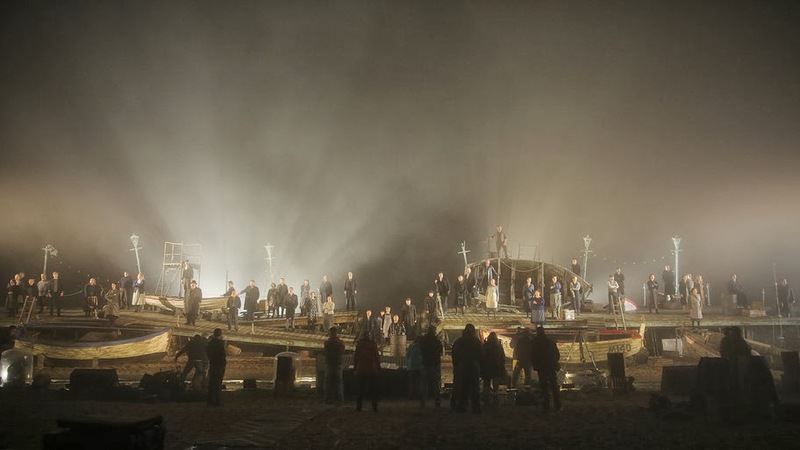 It captures the performances of the opera which were given on Aldeburgh beach this summer as part of the Aldeburgh Festival. The live performances were astonishing enough but on this film directed for the screen by Margaret Williams, Tim Albery's production is captured and transformed into a visceral cinematic event. Alan Oke's account of the title role is a career defining performance, with Giselle Allen as Ellen Orford, David Kempster as Bulstrode, Gaynor Keeble as Auntie and Catherine Wyn Rogers as Mrs. Seeley. The chorus of Opera North, the chorus of the Guildhall School and the Britten Pears Orchestra are conducted by Stuart Bedford. Performances took place on the beach with Leslie Travers fixed set of boats and quayside placed on the foreshore. Conductor Steuart Bedford was placed in a hole in front of them, wearing a high vis jacket. He conducted a recording of the opera made at the time the commercial recording of the piece was made earlier this year. (see my review). The soloists and chorus stand outs all had microphones singing over the top of the pre-recorded orchestra and chorus. The film is somewhat low budget so that individuals' microphones are very visible. But none of this matters. Despite the karaoke nature of the enterprise and and the cold and the wind, performances are gripping. Albery and Travers set the production in the 1940's and the film builds on this by starting with the Borough cheering a spitfire doing a loop the loop in 1945, shot in black and white, this sequence morphs into Alan Oke's Grimes walking along the seashore shot in colour, as the music starts. Through out there are shots of the sea and shore, distant views of Aldeburgh which help create atmosphere and place the opera in the landscape. But it is the weather which contributes enormously, so much so that it is sometimes difficult to believe that what we are seeing are natural events and not contrived. Alan Oke is quite a sympathetic Grimes. Vocally closer to Peter Pears (whom I never heard in the role) than Jon Vickers (whom I did). Remarkably these performances were his first in the role. He is very much a loner, unable to communicate and his fit of violence with Giselle Allen's Ellen is through frustration rather than anything more vicious. 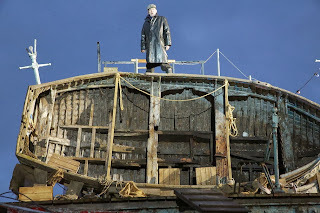 Oke brings out the poetry of the role in the inn scene, where Oke sings his solo from a platform above the stage, looking at the heavens indeed. The mad scene in act 3 is moving and involving. A fire burning in an oil drum forming both a metaphor and striking visual image. Giselle Allen was a moving and sympathetic Ellen, utilising the rather buttoned up 1940's ethos to create reserved but sympathetic character. Her embroidery aria was beautifully done, vocally flexible and full of poignant poetry. David Kempster was quite a reserved Bulstrode, nicely spoken and finely musical, rather less bluff than some. Catherine Wyn-Rogers was a vivid Mrs Sedley, ubiquitous in her nosiness. Gaynor Keeble with her red lips and brightly coloured blouse was every inch a landlady. Her pub might have been an old boat, but she was atmospheric nonetheless. Because the set was non representational this meant Albery took advantage of the whole stage for the inn scene. One of the vocal high-points for me is the women's quartet and Keeble, Allen and Alexandra Hutton and Charmian Bedford (as the nieces) did not disappoint. The remaining cast were very strong, with. Robert Murray as a virulent Bob Boles, Christopher Gillett nicely ineffective as Rev Horace Adams and Charles Rice as a very spiv-like Ned Keene, with Henry Waddington as Swallow and Stephen Richardson. There is a very strong ensemble feel to the performance, the cast work truly work together and get a community feel to the performance. To a certain extent this is caused by the travails of putting on the opera in such trying circumstances, as the cast relate in the interviews captured on the extras on the DVD. Given that the production circumstances were so trying, with the cast battling the elements, it is remarkable that the performances captured on film are so thrillingly detailed. This is the least theatrical of opera films, it feels as if we are simply watching a film. 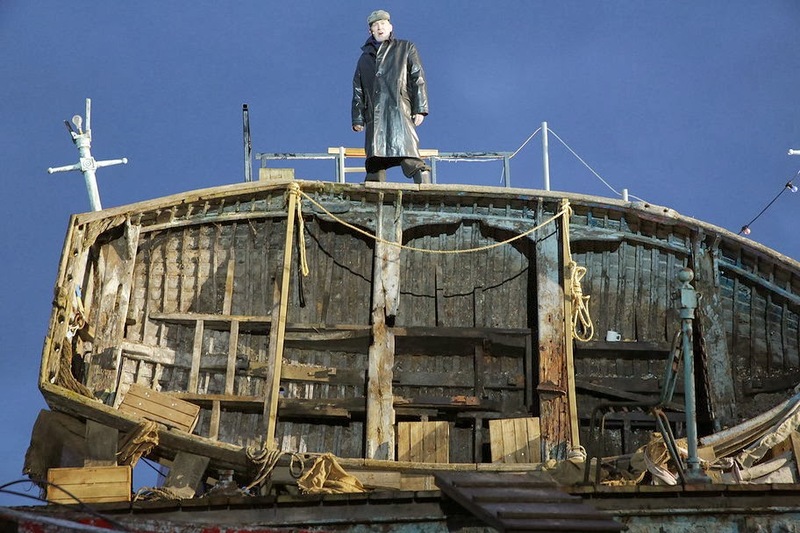 The DVD includes interviews with the cast, a fascinating time-lapse film of the set being assembled and an introduction to the opera by Jonathan Reekie of Aldeburgh Music. Albery's production used the stage area to full effect, with the chorus working hard clambering about. But ultimately it is the weather we remember, images of scudding clouds and blowing wind, and how they complement the dramatically visceral performance.